Looking for a delicious blender muffin recipe? 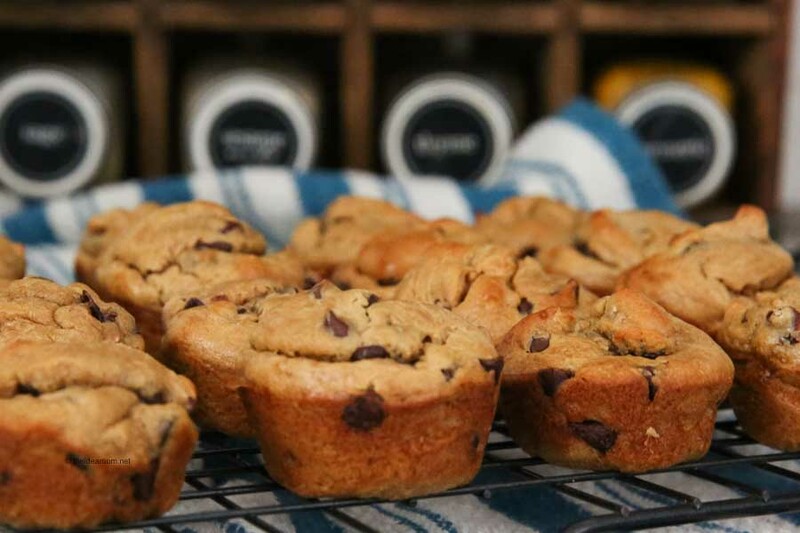 Try these moist blender muffins That are made with creamy peanut butter, bananas and chocolate chips for the perfect flavor combination! It seems kind of strange to mix up a batch of muffins in your blender doesn’t it? But making muffins in the blender is so easy to do and creates a lot less dishes for you to clean up when you are finished making your muffin recipe. 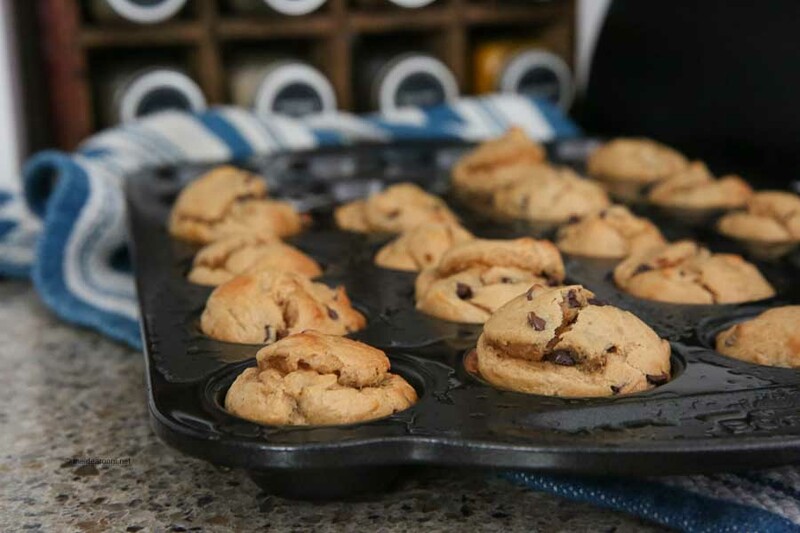 It takes just a few seconds to blend all of your ingredients together to create your muffin batter and then you can easily pour the batter mix right into your greased muffin tins! No fuss and no mess! 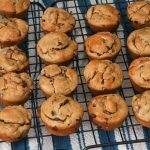 Blender muffins are simple to make and you can simply toss all of the ingredients, except for the chocolate chips, directly into the blender. Then you will blend them until the mixture is nice and creamy. You may need to scrape down the sides of the blender to make sure you get all the ingredients mixed if some of them splash up onto the sides. I simply use a rubber spatula to make sure I get all the goodness mixed together! 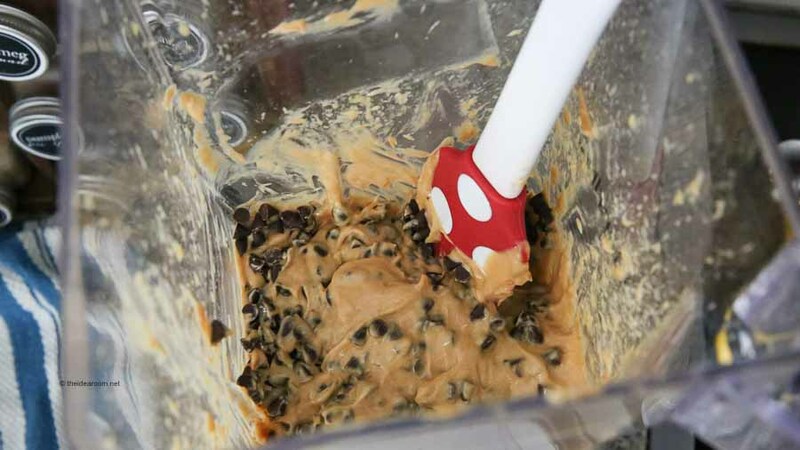 Once the ingredients are mixed together well, you can stir in the chocolate chips. This way the blender won’t pulverize them into tiny pieces. 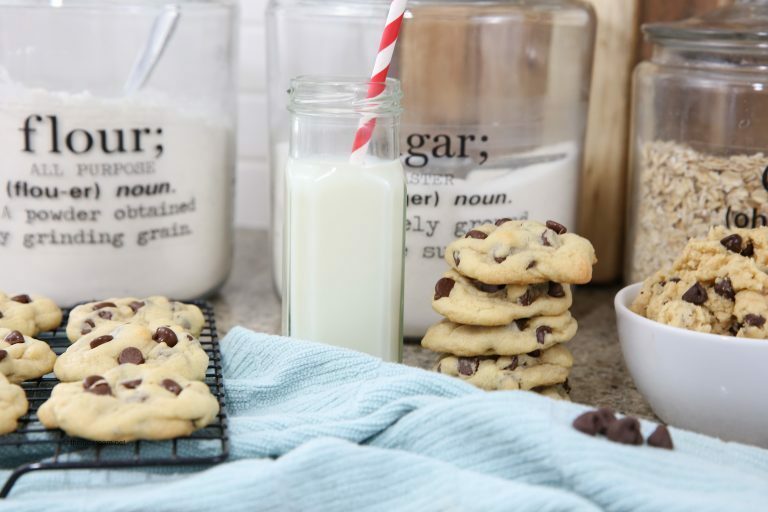 We love to use the mini chocolate chip pieces, but the regular size will work just as well. These peanut butter banana muffins are flourless. So how do they end up so light and fluffy? The egg, baking soda, and banana give the muffins the texture and fluff that you want in a muffin. This is our go to gluten free banana muffin for my daughter who has Celiac Disease. It’s nice to be able to make them for my family because I know that it is something she can enjoy with us. These muffins are so tasty! 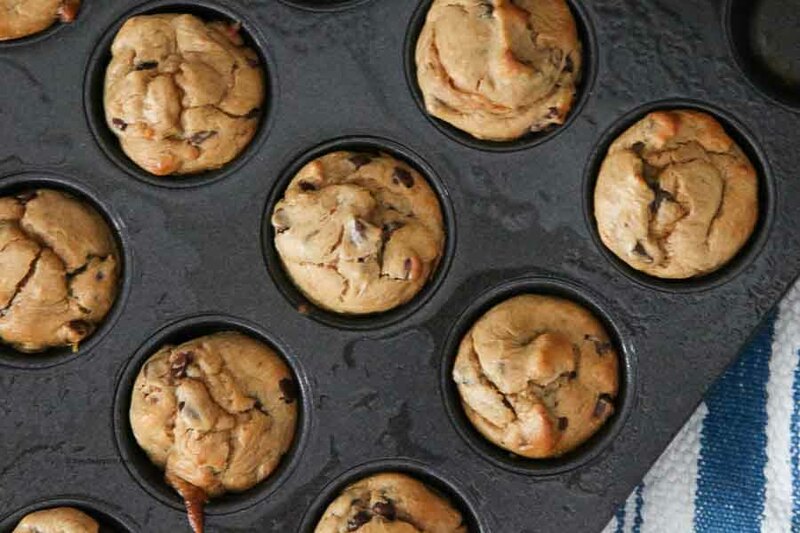 You can bake them in the mini muffin tins like we do for a tasty little bite-sized snack…or use a regular muffin tin. If you use a larger muffin tin, you will need to increase your baking time so that they cook all the way through. Test them with a toothpick to make sure they are fully cooked. 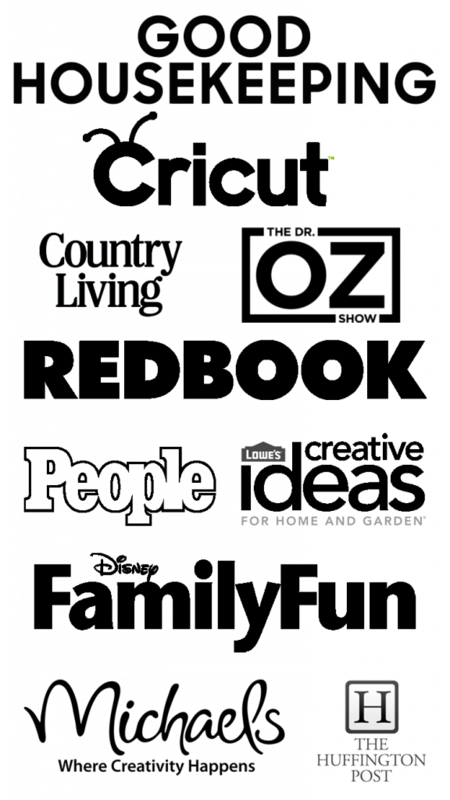 If you love muffins, check out our other Muffin Recipes. Prepare mini muffin pans with cooking spray; set aside. In the blender jar, add the first 6 ingredients and blend on high speed until smooth and creamy, about 1 minute. Scoop out small mounds of batter and place into greased muffin tin. Bake for 8 to 9 minutes, or until the tops are set and springy to the touch. 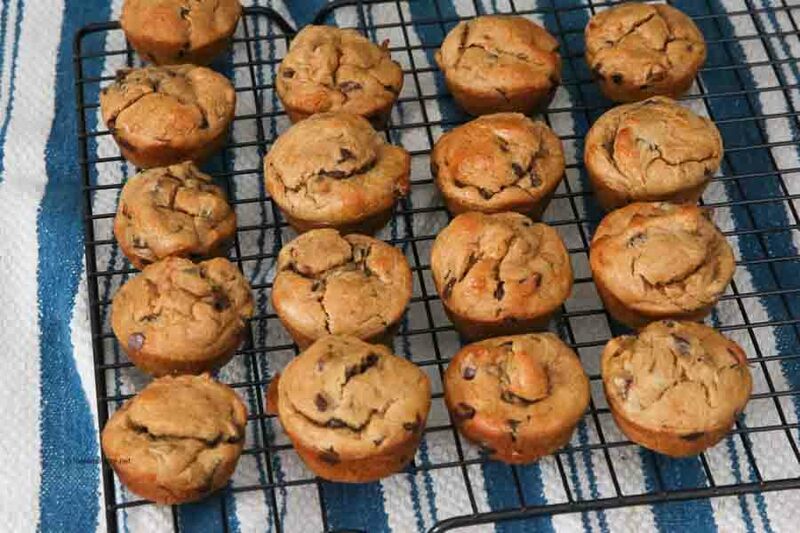 Allow muffins to cool in pans for about 10 minutes. 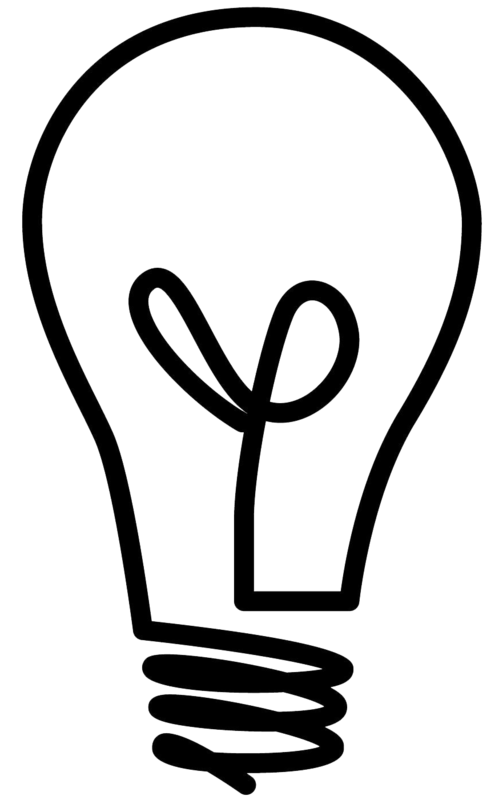 Muffins will keep better in an airtight container at room temperature for up to 5 days, or in the freezer for up to 3 months. How long would you bake for regular sized muffins? I would think about 10-13 minutes. Check them with a toothpick inserted in the center of the muffin. If it comes out clean and they are springy on top then they should be done. Dotty- Yes it is a Tablespoon. You can use less if you want to though. It says to add the first 7 ingredients in the blender before you add the chocolate chips…I only see 6 ingredients before the chocolate chips. Meesh- Thank you for letting me know about this mistake. I will fix it. I put a tablespoon of vanilla in… we will see how they turn out! Can you post the nutrition value? 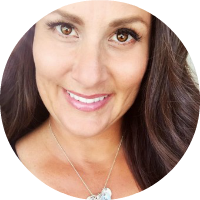 Michele- I will look into the nutritional value. Thanks. any chance you know how many carbs are in a muffin? Heather- I am not sure. Sorry. I made these this morning and they are yummy! I’m always happy to see nutrition facts attached to recipes. Thank you. Bonnie- Yay! So happy you enjoyed the recipe!